This past May, my Oma (grandma) passed away. My sister and I were fortunate to grow up right around the corner from her. She took care of us before and after school while my parents were working. Since her passing, I have vivid memories of things we did together including some mundane daily rituals, that remind me of the comforts of home. Oma pretty much ate the same thing for breakfast as long as I can remember. 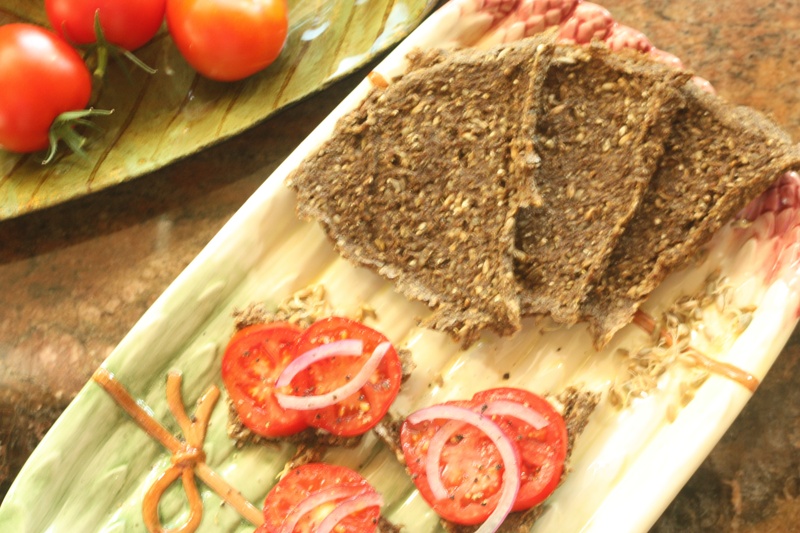 Her ritual was the bread that she referred to as pumpernickel, which was thick, dense and full of whole grains, with butter, tomato, a thin slice of onion, salt and pepper. Before my mom and I started the Dad Says It’s Toxic diet, she made us a plate of these open face sandwiches, which brought me back to a very happy place. I have been craving them since and decided that this bread should be fairly easy to pull of in a dehdraytor. I was right. The only things I wish I were able to change is that I would have made a double recipe and that I had rectangular dehydrator sheets so I could make more uniform slices. This will definitely be a new staple in our house and I can not wait to make other sprouted breads! Dad was amazed how the entire house smelt like bread. He had no idea that raw bread was possible or that it could taste so amazing. Mix chia seeds together with 1/2 cup water and set aside for fifteen minutes. Put 2 cups sprouted rye, sunflower seeds, flax, nutritional yeast, caraway seeds, and salt in food processor. Turn on for 30 seconds. Scrap sides. Turn on for 30 more seconds. Put dates and water into a blender and blend on high for 30 or until dates are well ground. Pour dater water and chia seeds into sprout mixture and run for 30 more seconds. Scrape sides again. Run for 15 more seconds. Add remaining 1/2 cup of sprouts and pulse 15 times. scraping sides after 8 pulses. Spread batter over sheets, 1/4″ thick. Run a knife or spatula through where you will want to cut later. Dehydrate for 4 hours on 115 degrees. Cut where you marked at the beginning. Flip over and dehydrate for 4 more hours. Serve. Seal remaining in an airtight container. Will stay good for approximately 4 days. If you don’t have a dehydrator you may bake in oven at lowest temperature. Cooking time will change. Make sure slightly crispy before flipping. My sincere apologies for initially titling this Gluten Free. I was misinformed and did not do my fact checking. It turns out rye is packed with gluten. Gallery | This entry was posted in Bread, MOFO 2013: Dad Says It's Toxic, Raw. Bookmark the permalink.